We source our charcuterie meat from Italy, Spain and Germany. We only use European Pork. 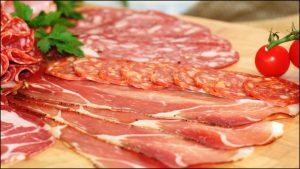 The curing process for salami and cured hams is a very traditional form of food production and preservation. Salt is used to draw out the moisture and then it is air dried to produce the salami/cured ham, which can take from 3 weeks to 12 months depending on the product. We buy directly from the source, ensuring we offer the most authentic charcuterie to our customers. The Charcuti® range is perfect for antipasti and tapas platters, or as a pizza topping!